Delicious and different, this is the kind of smoothies we should enjoy with the family at breakfast or brunch. One more way to enjoy the fruit naturally, always giving the best for our family. Low in fat and sugar which is ideal in the diet of our children, great for maintaining a healthier digestion. This recipe can be varied in many ways, add vanilla ice cream, orange juice or any other ingredient you want, let your imagination run and make the papaya smoothie your favorite beverage. Place all ingredients in a blender, blend until well incorporated. This recipe makes 1 smoothie. Delicioso y diferente, éste es el tipo de batidos que debemos disfrutar con la familia al desayuno o media mañana. Una forma mas de disfrutar la fruta de forma natural, siempre dando lo mejor a nuestra familia. Bajo en grasa y azúcar lo cual es ideal en la dieta de nuestros hijos, excelente para mantener una digestión mas saludable. Esta receta la puede variar a su gusto, agregarle helado de vainilla, jugo de naranja o cualquier otro ingrediente que desee, deje volar su imaginación y haga del batido de papaya su bebida favorita. Coloque todos los ingredientes en una licuadora, licúe hasta que este todo bien incorporado. Esta receta hace 1 batido. 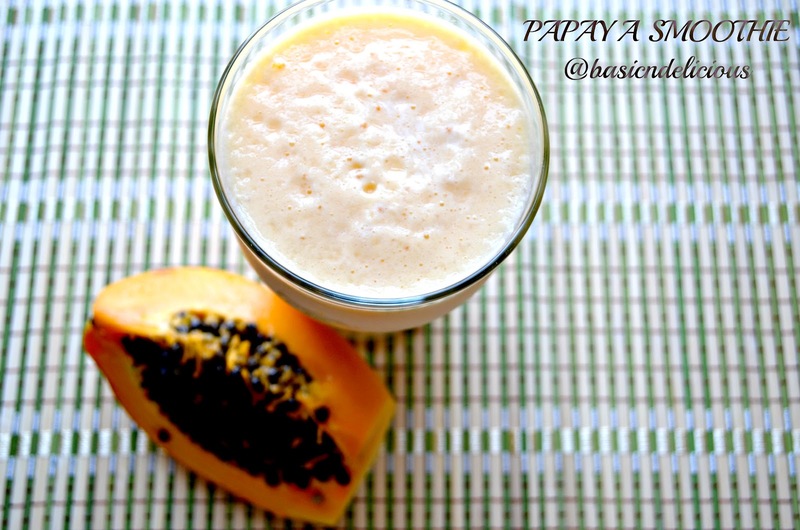 This entry was posted in Uncategorized and tagged papaya, smoothie by Kathia Rodriguez. Bookmark the permalink.